It's Friday morning - and it's THE Friday morning before Christmas! Just think, next Friday, you will most likely be sitting in the midst of discarded wrapping paper, shredded ribbon, sleepy spouses, excited children and the prospect of a (hopefully) wonderful homecooked meal to look forward to. Makes you just want to go stamp something doesn't it?! Well, for today's Blogger's Challenge, our challenge Mom Lisa gave us a great sketch to work with - it's at the bottom of this post for you to see. That sketch, combined with a fabulous Color Challenge over on our Stamping 411 blog was all the inspiration I needed to sit down and make this card in just 1/2 hour! What do you think? Yes, I know! I've used my soon to be gone, favorite flower stamp set Garden Greetings again! It's retiring on January 4th along with the greeting set I used here - Really Retro. Hence the greeting I chose for my card.... 'miss you already.....' sniff, sniff! The next layer is Certainly Celery cut at 4 1/2" x 3 1/4". It also got a run through the Big Shot, but with the Texturz Plates! I then sponged some Certainly Celery ink on top to accentuate the subtle embossing. My stamped layer is Whisper White cut at 2 1/2" x 2 3/4". I used the medium and small flowers from the stamp set and collage stamped them in Certainly Celery ink and Garden Green ink. 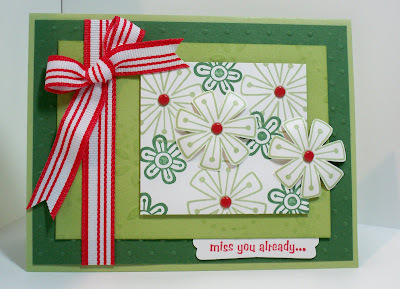 I stamped two extra medium flowers and trimmed them out with my Paper Snips, popping them up on Stampin' Dimensionals. All of the celery flowers got Real Red Brads in the centers. This entire layer was popped up on Stampin' Dimensionals too. I added some Real Red Striped Grosgrain ribbon to the left side for that element of the sketch and made a little bow which is attached with Mini Glue Dots. As you can see, in place of the three elements at the bottom, I chose to put my greeting there. It's stamped in Real Red on a Whisper White scrap and punched out with my Modern Label punch. Thanks so much for stopping by to say hi today! Now if you have time, be sure to check out all the other takes on this sketch by clicking on the Blogger's Challenge link in my sidebar. I know these ladies will have come up with some fabulous creations for you! 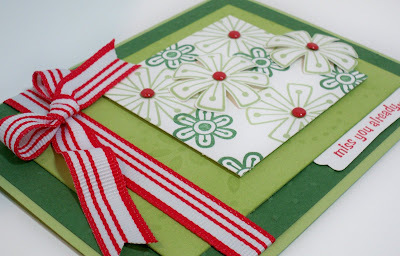 Be sure to come back tomorrow and see my Stamping 411 Sketch Challenge creation this week! I love it when you visit me and leave me some comment love! That is a lovely way to create your own dsp and I like how you used a "tab" for the triple element portion of the sketch! Adorable! Great take on the sketch, wonderful choice of colors! Love the way you popped those flowers! I'll miss both these sets when they retire. Great card! When I was watching the Weather Channel and heard the forecast for the DC area, you were the first person I thought of. I knew you would be loving the snow!!! Robin, your card is lovely. I know you are going to miss that stamp set so much. 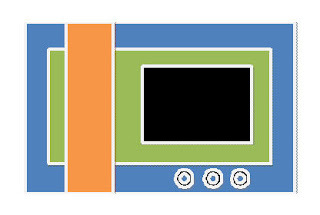 I love that color combo too (tee hee)!!!! I didn't get this set and absolutely love this card -- if I had seen more like it, I might have bought it! You did a great job with this set -- no wonder you don't want to see it go! FUN card - love the colors you chose. Great job with the sketch! What a fun card. Love the cheery color scheme and the fun flower design. Great colors--very fun, but yet very pretty! Fun color combination for these flowers! Enjoy all of this snowy stuff! Wow...great idea to use that set in festive holiday colors! We are on the outer fringe of that storm and are getting about 6" of snow. I hope to finish up wrapping and cards, too! This is super cute and so much fun to look at!!! I love it!! The color combo along with these stamp sets is perfect!!! AND everytime I pull out this stamp set I think of you since the only reason I bought it was a swap card I got from you using it!!! I LOVED THAT SWAP CARD AND STILL HAVE IT!!!! !